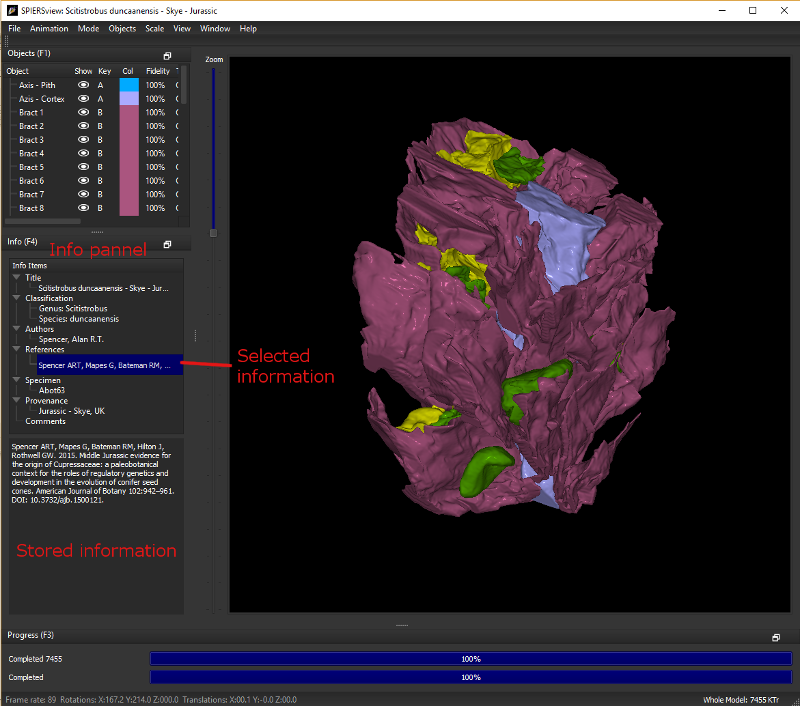 SPIERSview allows models to be supplemented by textual metadata, viewed and input through the Info panel (see Fig. 3). This data is broken into the following headings: Title (A title for the model – this will appear in the title bar of the SPIERSview window), Classification, Authors (intended as authors of this model), References (either to papers or URLs to web resources), Specimen (Specimen numbers etc), Provenance (where specimen is from, including geological age if applicable) and Comments (for miscellaneous notes not falling into above categories, including copyright messages). Each of these categories can have none, one or more textual notes contained within it, the exception being Title which can have at most one. Classification also differs in that items consist of two parts, a rank (e.g. Genus) and a name (e.g. Homo), which are input separately. The upper window of the the Info panel, is known as the Info items window. It lists these categories, and if any contain data, these are listed subsidiary to the category as items (you will need to expand the category to view them). To view the data in a category simply select it: all items will then be displayed in order in the lower Info detail window of the panel. Items can be added by double-clicking on the category heading in the Info items window, deleted by selecting the item in Info items then using the delete key, or edited by double-clicking on the item itself. Attempting to delete a category will delete all items within it, but will not remove the category heading.